Lifts negativity, brings cooperation and helps with expression of love. Helps to focus on the positive things in life and bring relaxation. 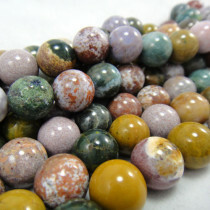 Like many Jaspers also known as Orbicular Jasper which contains orbs inclusions. 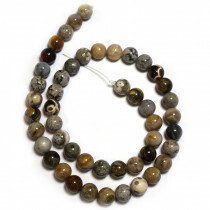 Ocean Jasper Round 4mm Gemstone Beads (~100pce Strand) - 40cm/16'" Strand. 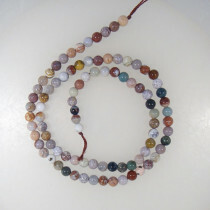 Ocean Jasper Round 6mm Gemstone Beads (~66pce Strand) - 40cm/16'" Strand. 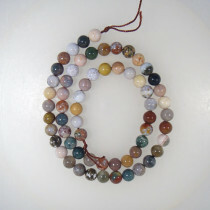 Ocean Jasper Round 8mm Gemstone Beads (~50pce Strand) - 40cm/16'" Strand. 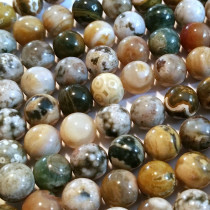 Ocean Jasper Round 10mm Gemstone Beads (~40pce Strand) - 40cm/16'" Strand. 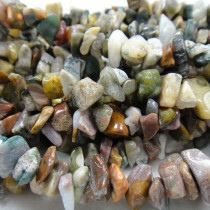 Ocean Jasper Stone Chips 5x8mm (~160pce Strand) - 91cm /36'" Strand.